Create a traditional or modern design to your liking. Build a thermally efficient room that lets in lots of light and creates a sense of space. For modern conservatory ideas and prices, contact us. The Classic Conservatory features a glass conservatory roof designed to flood your new room with lots of space-creating light. Using contemporary technology, your classic conservatory will reward you with a room that is warm and bright. Features like the Ultraframe insulated pelmet – and super-insulated columns – deliver low U-values and an attractive aesthetic and can be added to our classic conservatories. 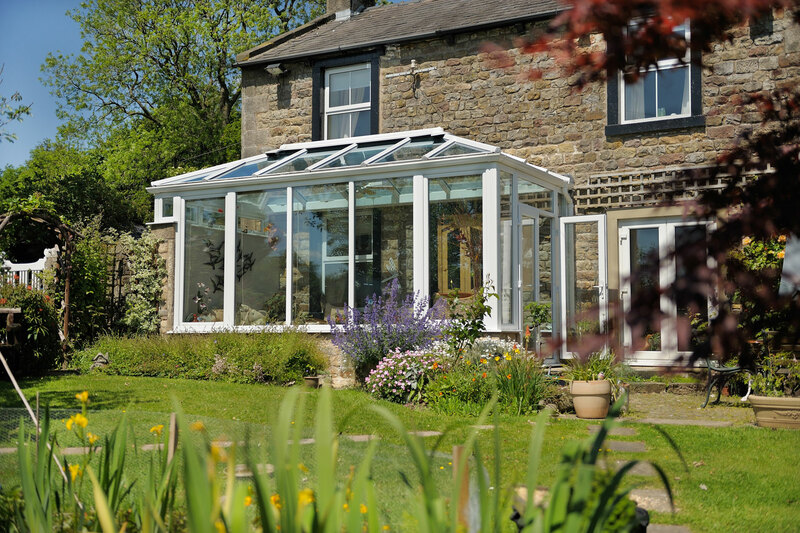 Traditional and contemporary styles can be achieved with a classic conservatory. Fox Windows has experience of helping customers in Kenilworth, Leamington Spa – and the local areas – design their dream rooms. Contact us for advice. Inside the classic conservatory we’ve installed, the super-insulated columns will be internally plastered. An insulated pelmet will skirt the interior of your room and prevent vital warm air from escaping. Lighting can be fitted into the pelmet to create a cosy effect during the evening, when little natural light can penetrate. A classic conservatory stands out from the crowd when super-insulated columns are used as part of its design. A contemporary or traditional effect can be achieved by using plain or fluted columns and this feature can achieve a U-value of 0.16 - which is far higher than that which can be achieved by a brick pier of equivalent size. You won’t be restricted by choice when designing your classic conservatory. The systems we use with this style work with most popular building shapes. This means we can build a small conservatory with a lean-to roof if limited space is available, or a P-shaped conservatory if your garden is large and you want to create a two-room structure. Your classic conservatory will make even more of an impact if you ask us to fit a decorative cornice. Two types are available: a flat version that works with almost all of Ultraframe’s conservatory roofs, and a curved one that fits at right angles and is compatible with every entry in their range. Either way, you’ll be able to find your perfect fit. Colour will play an important part in your design scheme. Your new classic conservatory should flow naturally from the main body of your home, but never take over. We’ll talk you through the range of shades available to ensure your new room looks the way you expected it to. Why not create your dream conservatory online using our design tool? Fox Windows and Doors knows how to create compliant designs that meet the requirements of planning and building regulation departments. Whether you want to build a new lounge or an open-plan kitchen diner, we’ll make sure your classic conservatory meets all necessary requirements in full. Ask for advice when discussing your plans with our team. The Classic Roof can be built to your size specification. This ever-popular glass conservatory roof can be used to create wider structures too – giving you even more control over the eventual design of your classic conservatory. Add wide-spanning bi-fold doors to create stunning panoramas of your garden and ventilate your room during the warmer weather. Enjoy the benefits of a strong aluminium roof that, like the Classic, can be used to build large structures. An internal pelmet can be added to improve internal comfort and super-insulated columns can still be added to create your preferred modern or traditional effect. Choose any colour to finalise the appearance of your stunning new room space. You won’t even have to leave your home. We’ve added a brand new Virtual Reality tool to our website that allows you to explore every conservatory, orangery and house extension in our range. Once you’ve settled on a product that you like, contact our team or use our design tool to generate an online quote for your new classic conservatory. Fox Windows works with customers throughout Kenilworth, Leamington Spa and the surrounding areas. We are registered Ultra Installers and members of the Which? Trusted Trader scheme for your peace of mind. Find out about the products we sell and how we can tailor them to your requirements by contacting us today. The Classic conservatory can be customised to create a modern or timeless design. Create your conservatory online now and get a quote within minutes. We offer glazed conservatories in Kenilworth, Warwickshire, Leamington Spa and surrounding areas. If you would like to find out the cost of a classic conservatory, you can use out quoting system for your online quote, or contact us today. Talk to a member of the Fox Windows team today to book your appointment and create the glass room of your dreams.